Enter Vassa and talk to Therander Polle. Agree to sit on the thrones. Fight off Maugrue the Steward. Talk to Alenion Eulius, Marks and Interim Captain Cartello Stirk to collect your rewards. After weaving your way through the gate puzzle in Vassa Tarnabye with your companions in tow, you will finally enter Vassa proper. Inside however, a surprise awaits. Therander Polle approaches you and informs you that the door from which you just came in is locked. He also insists you all take a seat on the thrones on the lower level. Once you do, you will realize you can't move anymore - the thrones are trapped. Therander once again comes up to you and tells you that he'd discovered the ruin once he begun excavating and that he thought the Ayleids must have stored some of the mine's gold inside it. However, he needed four people to sit on the thrones to open the door to Vassa Morisel for his plan to work. Content with the idea of having tricked you and your companions, he sets off to claim the gold - never to come back. After a few seconds, you will notice a lich entering the room from Vassa Morisel. He will position himself atop the stairs and proclaim his freedom from his "Ayleid captors". Once his speech ends, he casts a spell on Amarius Eulius, killing him instantly but freeing you and your remaining companions from the thrones. Finish off Maugrue and talk to Alenion Eulius, who, while grief-stricken, will thank you for your deed and reward you with his late brother's mace. If you talk to Alenion again, he will tell you to inform Interim Captain Cartello Stirk about the events that unfolded in Vassa. Before you set off, however, remember to talk to Marks too, as he will reward you with a precious family heirloom: the Dunedweller Dagger. Exit the ruin and find the captain, who will for once genuinely congratulate you. He tells you that Polle's wealth will be shared among the miners and rewards your bravery by presenting you with the Stirk Rapier, a Stirk Cuirass and a Stirk Shield. On rare occasions, Amarius Eulius won't follow you into Vassa's final room. Although he isn't seated, the thrones will still work and Maugrue will appear as scheduled. Instead of casting his spell, he will loiter around until the scripting that frees you from the throne is activated. After the battle, Amarius' body should be found in Vassa Tarnabye. On other occasions, Amarius will enter Vassa but remain standing near the stairs. Although this isn't serious in itself, it is likely to cause other bugs. Another bug may occur when Polle leaves the room to enter Vassa Morisel. For reasons yet unknown, Maugrue the Steward does not appear and you will remain seated on the throne. The only way to solve this is reloading a save before you enter Vassa. This bug is more likely to occur if you have experienced the above one. Yet another bug affecting Maugrue may take place once Polle has left Vassa. 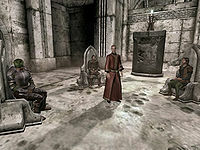 While the invisible NPC that regulates Maugrue's speech enters the room, he doesn't start talking, thus causing Maugrue to remain in Vassa Morisel. This bug appears to be connected with the previous one. Be sure to talk to Marks before talking to Interim Captain Cartello Stirk, since after talking to the captain, all of the miners will be disabled from the game. This effectively forfeits your reward from Marks. Once Polle is dead, Rogkuroth gro-Budok becomes the owner of his house. Once this quest is complete, the mine will be shut down, in the process impeding access to Vassa. 5 I entered the main ruin of Vassa, but it seems that the door has been shut behind us by some unknown force. 10 Therander Polle was waiting for us deeper in the ruin. He must have arrived just before us, after I solved the gate puzzle in the previous room. He has requested that we sit down in the stone thrones at the center of the room. 20 Once seated, I discovered that I was unable to stand from the stone throne. 30 Therander Polle believes that the Ayleids have harvested most of the gold from the mine and stored it in this ruin. He could not open the final door until all four of the stone thrones were occupied, and he has ensorcelled the thrones so that once all four of us were seated, we would be stuck. 40 Polle has left the room, and as far as I can tell, there's nothing we can do. 50 It seems Polle was wrong about the gold, and instead uncovered a powerful lich called Maugrue the Steward, who seems to have killed him. The lich killed Amarius Eulius, which seems to have broken the spell holding us to our seats. 60 Maugrue the Steward has been defeated. I should tell someone about the events that transpired here. 70 I was told to speak to Cartello Stirk about what happened here. 80 Finishes quest Cartello Stirk gave me some armor and a fine rapier in thanks for my service to Stirk. He also told me that the mine would be shut down, and Polle's fortune distributed among the miners. It is possible to use the console to advance through the quest by entering setstage Tr07q006VSecretOfVassa stage, where stage is the number of the stage you wish to complete. It is not possible to un-complete (i.e. go back) quest stages. See SetStage for more information. This page was last modified on 24 October 2018, at 06:42.